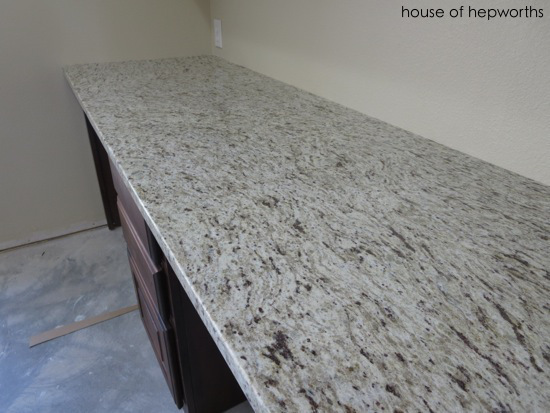 Last time I posted was to show you the new granite counters we just had installed. As promised, I’m back to take you through the process of picking out the countertops. 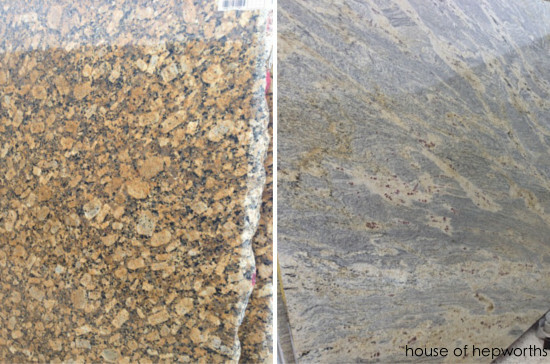 There are lots of countertop choices out there to pick from. 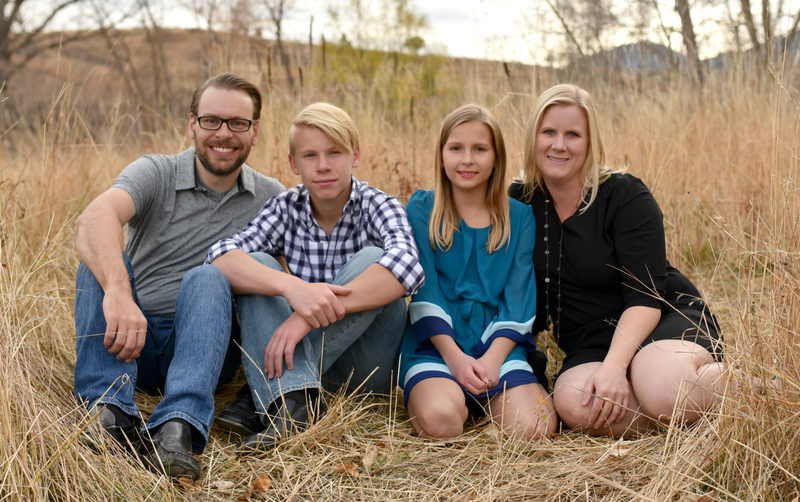 We narrowed down our choices quickly because we wanted a countertop that didn’t require much maintenance. That immediately knocked laminate and marble off the list. We wanted a light color so we nixed soapstone pretty quickly too. 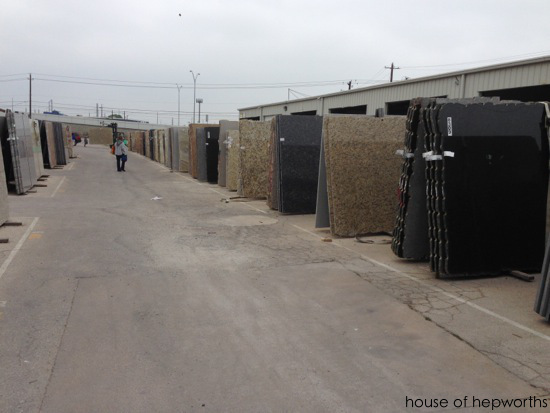 We were left with four main viable options to choose from: granite, solid surface, quartz, and concrete. Concrete was nixed right away because I just don’t want concrete counters. No other reasoning. It’s a good choice for a countertop, I just didn’t want it. Solid surface was nixed pretty quickly as well because the reviews online said it wasn’t quite as durable as quartz or granite. 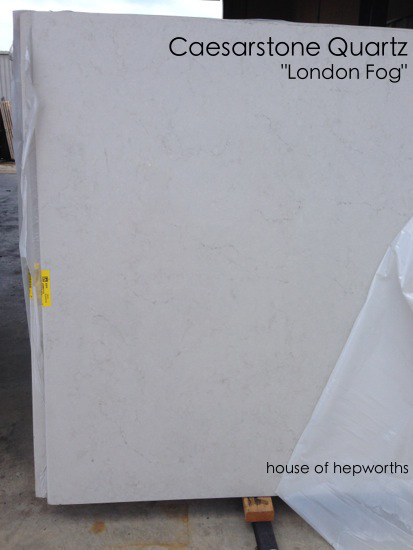 This left us with quartz and granite as our two main choices. I’ll be honest, granite was my last option. I was pretty set on not having granite actually. I feel like everyone has granite, and I just didn’t want what everyone else has. 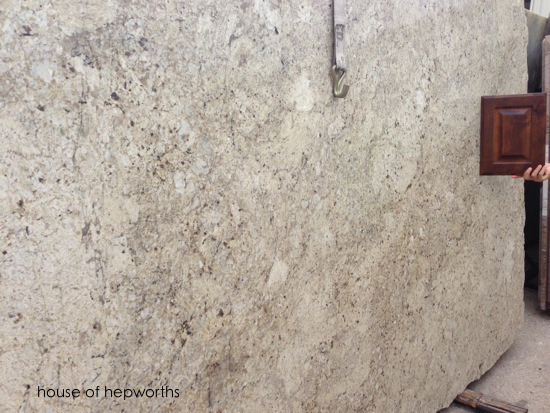 Except, in the end, there is a reason everyone has granite – IMO it’s pretty much the best of all options out there. It looks good, it’s in the lesser expensive category, and it’s virtually indestructible – you can cut on it, put hot stuff on it, pretty much abuse it and it keeps on keepin’ on. We really liked our quartz counters in our last house. They were a nice color and had a nice pattern. We did not like the quartz in our current house. It was a bluish color and chipped easily. However, I knew from some online research that quartz came in many brands, colors, and patterns. 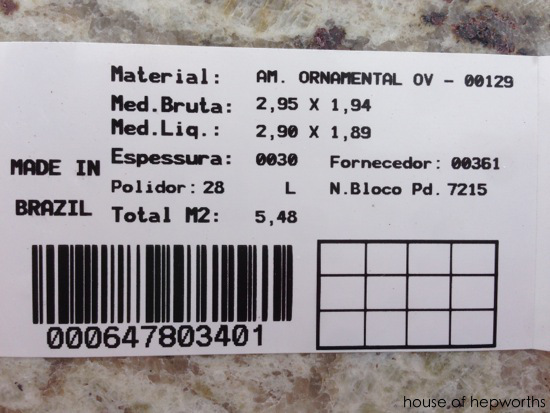 For months I assumed we’d settle on a quartz product when it came time to select the counters. We headed to the stone yard with a somewhat open mind and looked through all the granite first. It was nice, but nothing jumped out at me. But then I found it. I found THE ONE. Once I laid eyes on this marble-knock-off quartz product I was sold. I didn’t even look at any other slabs. We just left dead-set on putting this in our kitchen. I LOVE marble but marble is not indestructible and I would never put it in my kitchen, but a fake marble? Yes! Well, the quote came back for the marble-looking quartz and it was almost double the granite quote (our guy gave us quotes for both for comparison). The quartz would have cost us almost $11k to purchase and install. The granite came in just shy of $6k. 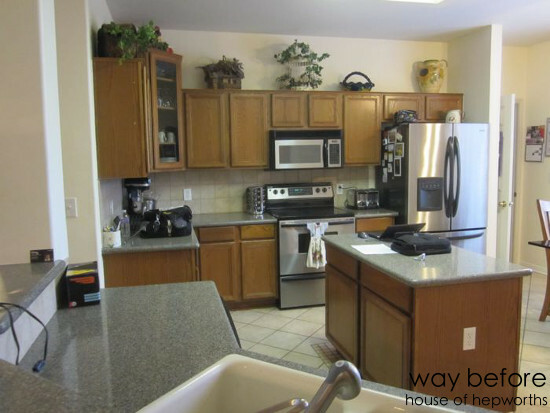 Most homes are not quite this expensive, but in addition to our kitchen, we also had a huge island, a built-in desk, and a long expanse of counters in the dining room. Our dreams were crushed. 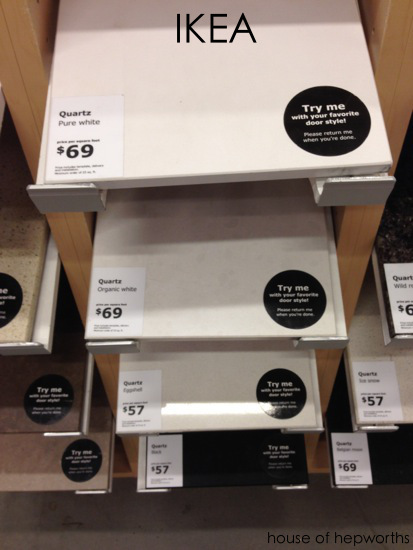 But then I remembered that IKEA sold quartz! Score! Because of a promotion they were running their prices were much more reasonable (around the same price as the granite). I just didn’t LOVE any of their options. They didn’t have the marble-looking option and also their counters weren’t as thick. Plus there was a 3+ week wait on installation. I tried to get on board but just had a sick feeling about the entire deal. So we went back to square 1 again. We headed back to the granite yard again to check out granite. I was determined to find a granite option that I liked enough and just go with it. This time though I took a door sample with me. 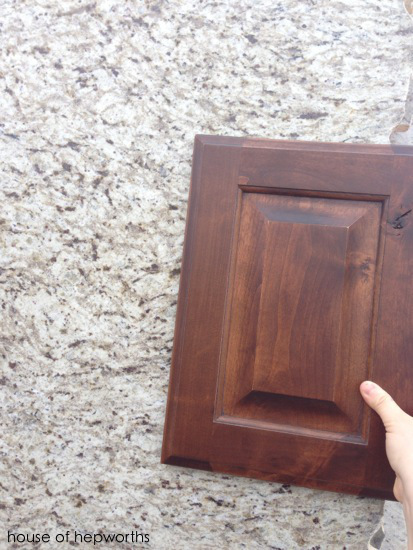 This is why my counters match my cabinets so well — I took an actual door with me to the stone yard. 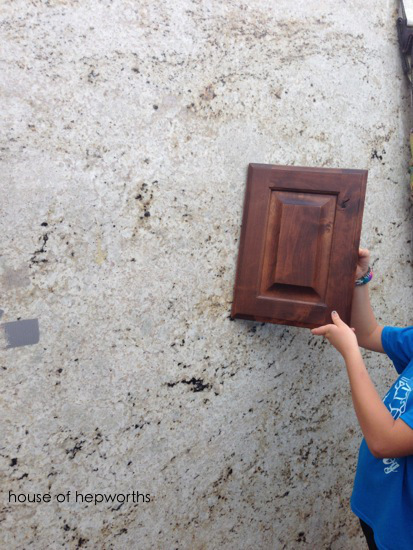 If you ever go to a stone yard, take a cabinet door with you! 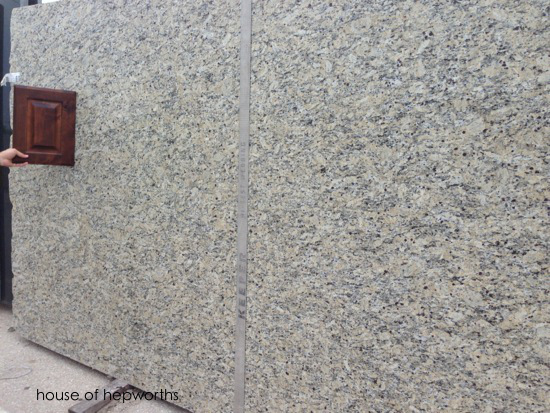 We went around and took pictures with every slab of granite I liked. Some were too light, some were too dark. Some were too busy. Finally, we found American Ornamental and knew it was the one. Well, I take that back. I hemmed and hawed over it for a long time. 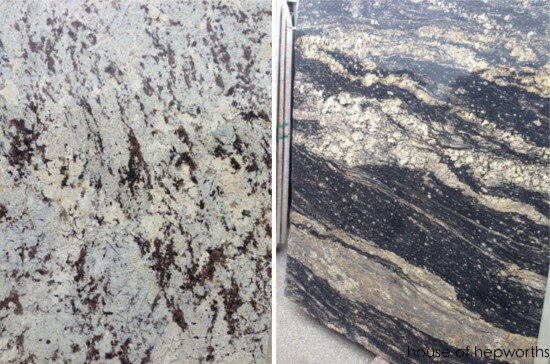 It was the lightest granite in the yard that matched the cabinet door and also wasn’t super-busy with wild patterns. 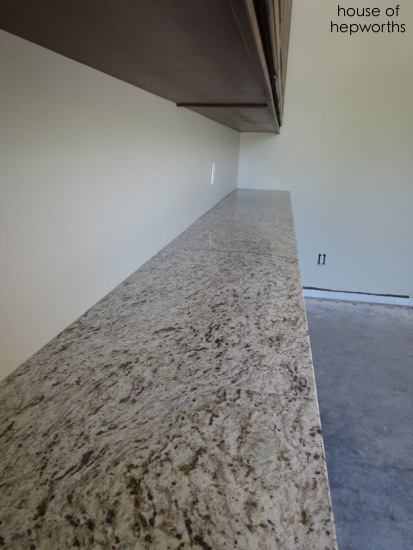 Looking at a full slab on it’s side is very different than seeing it flat on top of a cabinet. 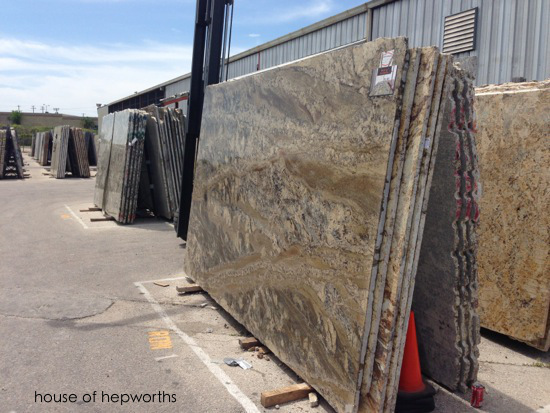 The way they are stored upright at the granite yard makes them really in-your-face so it’s hard to get a good idea of what it will look like installed. But we just went with our gut and selected it. 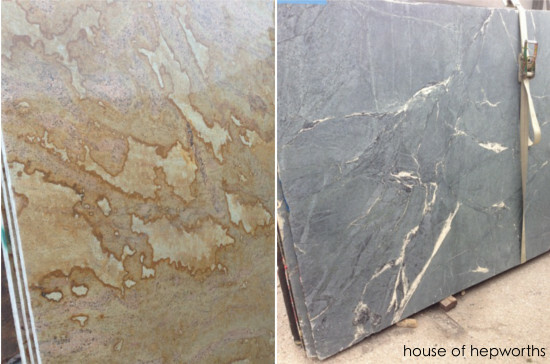 The funny thing is, the faux-marble quartz looked TERRIBLE with our cabinet color. I wanted it SO BADLY but when I took a door sample, I hated them together! In fact, it was so terrible together that I didn’t even take a picture of it. I did however take lots of pictures of really awesome crazy slabs of stone that were too wild for me or my kitchen but would have been really fun in the right setting. It was a fun experience to see all the crazy options and to think that they just formed over millions of years in the earth like this. 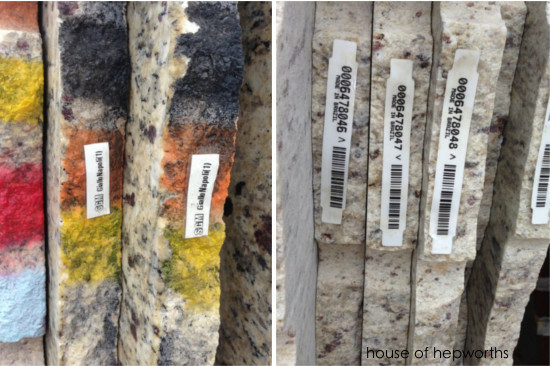 Here’s a sample of what the edges of the stone look like when shopping in a stone yard. 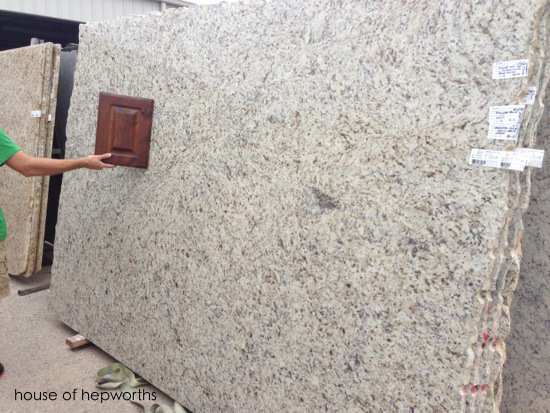 That is the long story of how we chose granite over all other options. It was the most durable and affordable option to choose from. I was pretty indifferent about it after choosing it, but once the first piece went in I absolutely knew it was the perfect choice for our house. I am so glad we chose this counter and not the quartz one. We love it. Am loving your new kitchen. You guys have did such a great job with the layout and useable space. And I love granite. Have it in mine and if I built again I would choose granite again. I have a darkish color so I’d choose a lighter one next time. Love the color of yours. good hearing from you again. it is nice to hear that others go through the process and that it is not just my not being able to make up my mind. it. is. a. process..
Love the countertop you chose! I’d LOVE to have that in our house, maybe one day. Hoping all is well with you, Allison! Betting you’re putting the finishing touches on your wonderful redo! This was really helpful! We’ve been wanting to remodel our kitchen for a while, and choosing a counter top has been quite tedious. We have been considering quartz, and seeing the variety of designs makes me that much more interested. 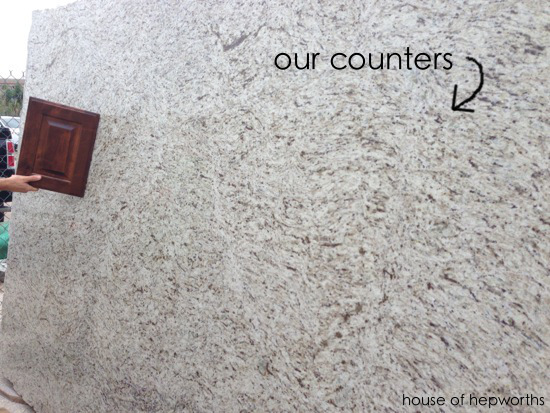 Hopefully we’ll decide on a material soon, hopefully it’ll look as nicely as your counter does! 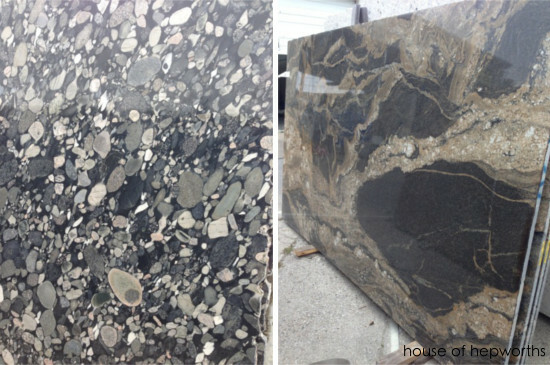 I love your adventure in finding the right countertop option. I agree that quartz can look great sometimes, but it can also look tacky sometimes. It’s great that you took a piece of your cabinets around the quarry with you! That’s a good way to find the right color of stone. just excellent and i could think you’re knowledgeable on this subject. Thanks for this. I just found your blog and I’m knee deep in a kitchen remodel. 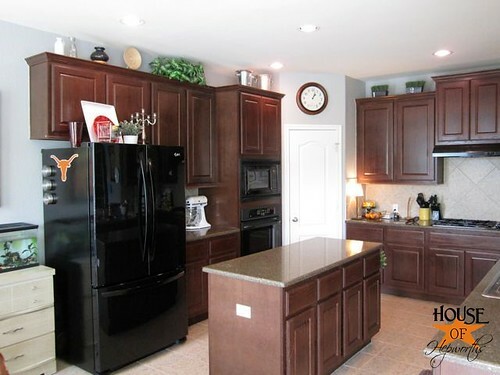 I love dark stained cabinets. Your beautiful kitchen really stands out from all the white and grays out there. And I love the granite you chose. Hopefully I’ll be able to find something similar when I go shopping. I’m excited to read more of your blog. Thanks for sharing your experience. Tiffany, good luck with your remodel! Just take your time and don’t agree to any finishes you don’t love. You’ve got this.